Though these drugs offer temporary contrast and relief, their success is based on the creation of a false state of well-being or oblivion. Meanwhile, the nervous system, which cannot maintain that state on its own, is thrown into a stressed state of imbalance by the drug’s impact. Substance abuse could be optimistically viewed as self-medication, but unfortunately it gives rise to further imbalance and consequent dysfunction in the longer term. There is a way to achieve wellbeing—inner happiness and balance—fullness within oneself naturally in a way that upholds health. Visionary psychologists, including James, Jung, and Maslow, recognized that the range of human potential includes the experience of a “transcendental” level of the mind which can profoundly impact the quality and meaning of life. To transcend means to go beyond—in the mind, that means going beyond the surface activity—the agitated narrow expressions of thought—to a field of unbounded wholeness deep within that is our essential nature. Most people have missed out on this transcendent experience entirely, or have only had glimpses of it or intuitions that something grander than their usual experience is available. Both Eastern and Western traditions have long asserted that the deepest need of humanity is to “know the Self”, this transcendent level of consciousness, one’s essential nature. Pursuing fulfillment or relief through drug use is a misguided expression of a fundamental desire to experience that. Fulfillment is within—it’s just a matter of giving the mind the right direction and it finds what it seeks. TM creates that inward shift in awareness effortlessly. By providing the experience of the transcendental field of life, our Self, Transcendental Meditation gratifies the unconscious craving for wholeness, fullness, and inner joy. At the same time, because of the deep rest, improvements in brain functioning, and biochemical normalization that take place during the TM practice, it also holistically nourishes all aspects of health and behavior. It is capable of simultaneously relieving problems related to substance abuse, such as in one’s behavior with family and at work or school. Although the TM program is not in itself a drug rehabilitation program, it is a means for self-development which results in a decrease of psychological and physiological problems—reduced drug abuse is an automatic side effect. Since TM strengthens the individual and produces an overall and stable state of well-being, it naturally diminishes the need and craving for drugs. 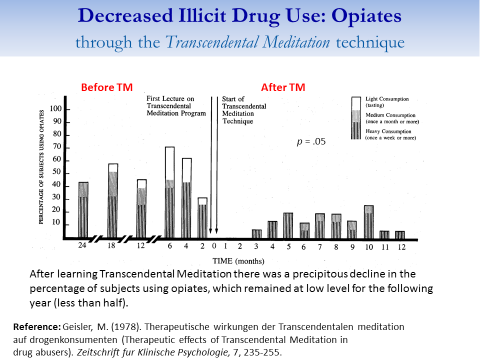 A paper on the Transcendental Meditation program’s effect on addictive behavior published in 1980 in Addictive Behaviors reviews research associating a decline in addictive behavior in the general population with continued practice of the TM technique and research suggesting that TM may be a useful adjunctive treatment modality for those with identified addiction problems. 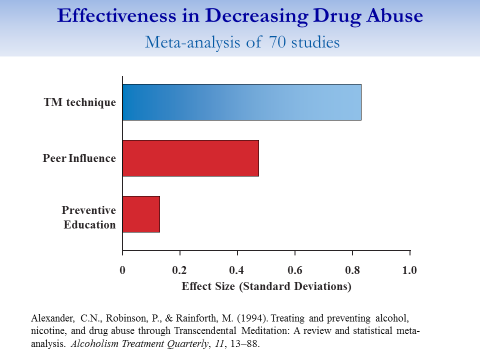 The paper also explores many of the broad range of mental, emotional, and physical benefits of TM as explanation for its success in reducing drug abuse. 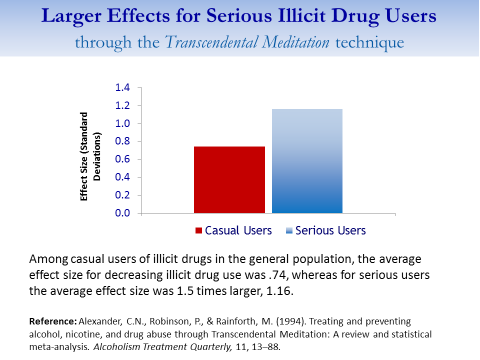 A study published in Alcoholism Treatment Quarterly showed that the average impact of TM practice on reducing drug abuse was almost twice as large as the impact of peer influence and six times as large as the effect of all other methods investigated. The Alcoholism Treatment Quarterly study’s data indicated that TM simultaneously deals with several physiological and psychological factors underlying addiction, providing not only relief from distress but also long-term improvements including well-being, self-esteem, and empowerment. For 18 months, the researchers studied 115 high school and college-age drug users who attended a German out-patient drug rehabilitation center. 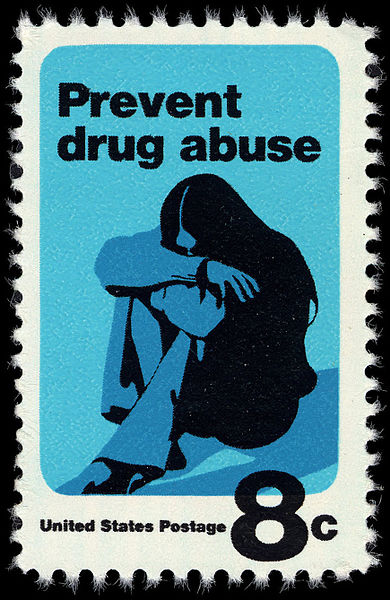 All were serious drug users and the majority reported multiple usage of illicit drugs, including cannabis, hallucinogens, amphetamines/barbiturates, and opiates. Seventy-six subjects learned the TM technique in addition to receiving standard out-patient drug counseling. The control group comprised 39 students of comparable gender, age, and severity and type of drug consumption; they received only standard out-patient drug counseling. The TM subjects showed significant, positive changes in both drug usage and psychological health relative to the controls; the rate of change increased with regularity and length of time practicing TM. After four months of TM practice, 50% of the group had stopped taking these drugs; by 18 months, 89% had discontinued using drugs. The TM participants also displayed enhanced psychological health on multiple measures of the Freiburger Personality Inventory relative to the controls—after only 2 months of their TM practice. In looking for wholeness and happiness, the last thing we want to do is compromise our ability to find them, which is exactly what we do when we use drugs. The motivation behind everything we do—good or bad, helpful or misguided—is the pursuit of happiness. With Transcendental Meditation, we actually achieve the goal of every single desire that will ever arise within us. And that goal is the absolute access to our inner strength and happiness—no matter what challenging circumstances we will inevitably encounter in our lives. Janet Hoffman is the USA executive director of Transcendental Meditation for Women Professionals.